WSPTA is divided into 13 regions to achieve a closer working relationship between local PTAs and councils. Each region serves as a focal point for leadership education, networking, service, and coordination within that region. By dividing the state into regions, local PTA and council needs and concerns can be met quickly and with greater understanding by a representative of WSPTA (a region director) who lives within the region. In 2016, the first area vice presidents were elected by the membership. The area vice presidents serve on the WSPTA board of directors to provide the governance (business) of the association. They work directly with the region directors to deliver training and resources to the local PTAs and councils within each region. Region 1 covers Clallam, Jefferson and Kitsap counties. It also includes the North Mason school district in Mason County. Region 2 covers eastern King County and consists of the Bellevue, Issaquah, Lake Washington, Mercer Island, Riverview, and Snoqualmie Valley school districts. Region 3 covers Clark, Cowlitz, Skamania and Wahkiakum counties. It also includes the Lyle, Trout Lake and White Salmon school districts of Klickitat County. Region 4 covers Grays Harbor, Lewis, Mason (except the North Mason school district), Pacific and Thurston counties. Region 5 consists of the Bethel, Carbonado, Dieringer, Eatonville, Fife, Franklin Pierce, Orting, Puyallup, Sumner and White River school districts in Pierce County and the Enumclaw School District in King County. Region 6 covers a portion of King and Snohomish counties. It consists of the Northshore, Seattle, Shoreline and Vashon Island school districts. Region 7 covers Snohomish County and Island County (except Oak Harbor). Region 8 covers San Juan, Skagit, Whatcom counties, and Oak Harbor in Island County. Region 9 covers a portion of King County. It consists of the Auburn, Federal Way, Highline, Kent, Renton, Tukwila and Tahoma school districts. 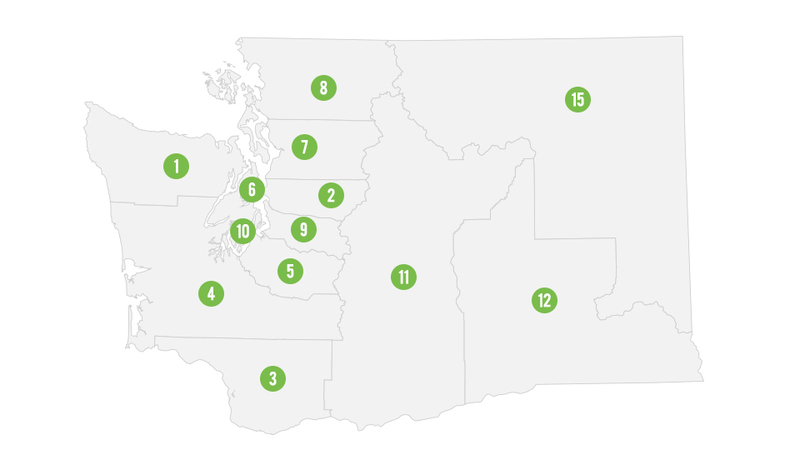 Region 10 covers a portion of Pierce County. It consists of the Clover Park, Peninsula, Steilacoom Historical, Tacoma and University Place school districts. Region 11 covers Chelan, Douglas, Kittitas, Klickitat (except the Lyle, Trout Lake and White Salmon school districts which are in region 3) and Yakima counties. Region 15 covers Ferry, Lincoln, Okanogan, Pend Oreille, Spokane, Stevens, Whitman counties and part of Adams County.